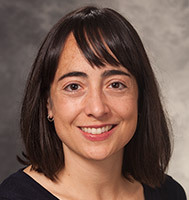 Dr. Mangin is a neurologist at the University of Wisconsin School of Medicine and Public Health. She specializes in movement disorders with special interest in dementia. Her medical interests include Parkinson's disease, atypical Parkinsonian conditions, tremors, dystonia (including use of botulinum toxin injections in treatment), ataxia, Huntington's disease, variants of frontotemporal lobar degeneration, Alzheimer's disease and palliative care. Dr. Mangin's teaching interests include optimizing symptom management in the context of movement disorders and dementia.